Down Syndrome | Downside UP Ltd. Downside Up won the grant! Moscow`s government Public Relations Committee informed public of «The Grant Competition – 2017» results. Downside Up Charity Fund was among the winners, and received a grant in nomination «Clemency and care: assistance physically challenged, and people with serious and desperate diseases ». The victory ensures that Downside Up Charity Fund can help to raise qualification of Moscow specialists, working with children suffering from Down syndrome and their families. The Committee`s Chairman Alexandra Alexandrova noticed that this year`s applications were well-thought-out. It was a step up in comparison with the last year. The number of NPO (non-profit organisations ) which took part in the Competition has also increased. «181 organisations were considered as the best. We are sure that Moscow government`s investment of 273 million rubles in the best projects will be helpful for the good of society», - Alexandra Alexandrova said. Read more about Downside Up won the grant! The end of this summer charity season «Sport for a cause» -2017 was marked by two cycling events: «Velosotnia» on August 26 and «Bicycle Race» on August 27. During this year all companies, who took part in «Velosotnia» raised more than 17 million rubles for charitable programs to help children with Down syndrome and their families. Several corporate teams took part in «Velosotnia» in the vast territories of Kaluga oblast this year. 11 amateur teams also supported the cycling event. Teams got over 110-kilometers of routes during the race and received unforgettable impressions. Together with young cyclists from «The Center for family support of «Downside Up» their parents and young people with Down syndrome also conquered the roads, among them: Andrey Vostrikov — multiple world champion in gymnastics among people with specific mental characteristics, winner of more than 70 medals and Stepan Bezrukov — swimmer, who already has over 20 medals. At the finish, the convoy was greeted by the most devoted fans — young wards of «The Center for family support of «Downside Up». They welcomed the participants by touching response ride on children's bicycles. Families and friends came to support the young cyclists. Children with Down syndrome visited Fire Station No. 4 in Moscow. The guys and their parents were shown the firefighters on duty, where they live while on standby duty, how they receive fire-alarm calls and what tools and equipment they have. Young visitors also were told how to put out a fire properly and how to behave upon detection of fire. The biggest excitement and emotions were from a photo session in a real fire truck and splashing around under water jet spray on a hot summer day. Children in ward of «Downside Up» charity fund participated in «Volunteer day» under the auspices of companon animals`s nutrition Center located in Moscow satellite town Lukovicy. All cynologists, vets and office staff of the Center welcomed «sunny» volunteers. Founded in 2009 in Lukovicy the Center today is a home for little under one hundred different breeds of dogs, such as tiny chihuahua, central asian ovcharka, poodles, spitz and others, popular among dog fanciers. Dogs of small breeds live in a modern one-floor building with offices, for staff only rooms, and a big hall cabined off for multiple «appartments». «For hundreds of thousands years people live under the same roof with companion animals. They make our world a more harmonious place to live in, and people need that cohesion» - welcomed guests acting director of the Center Tatyana Belyavskaya. Two by two under the guidence of experienced personel children were off to water dogs and cleaning. The most experienced volunteers had to scrub and flea dogs in special hairdressing room. The day finished with exchanging of gifts. Nadezhda Yakovleva, the lead specialist of «Downside Up» charity fund, presented staff of the Center with desk loose-leaf calendars pictured with drawings of «sunny» kids. Tatyana Belyavskaya in return presented children with merit badges of Cynoligists Assistent. The Annual spring benefit tournament «Charity sport» has taken place In Moscow`s sport center LFK CSKA. The sole purpose of the tournament was to support children with Down syndrome. 12 teams took part in the tournament. 10 teams represented leading football teams and 2 teams represented children`s parents of «Downside Up» charity fund. A sum of 1025000 rubles was collected by combined efforts. The money will be spent for football training of teens with Down syndrome as part of the project «Football for hope». For the first time ever, team of children with Down syndrome took part in competition! They had a friendly game at mini-football against all captain team. Match scores of the game are: first half 4:1, second half 3:0. Survey party from FIFA attended the game. FIFA, with their program «Sport for hope» since 2017 supports football training for children with Down syndrome. The children for couple of seasons already have been taught to play football by Alexandr Mahov as a coach. Alexandr Mahov is Dean of students in RGSU`s physical education faculty, doctor of education, member of Russian Paralympic Committee. «Downside Up» charity fund has recently had promotional program «To give the orange». Our activity was coincided with March 21, World Down syndrome day. We pursued the purpose to draw attention to mentally challenged people and raise funds for supporting people with Down syndrome. We chose an orange as our simbol because of it`s resembling to sun. As you may know people with Down syndrome are often called «sunshiny». It was easy to take part in our promotional program. All it took was internet. Everyone could visit our web-site, choose one of the fruits from the large tree and make a donation, making the fruit grow. After two weeks 1101 oranges were grown and 1240377 rubles were raised for «sunshine kids». Money we`ve raised together will be spent for speech therapists, teachers and other necessities for «sunshiny kids» including special social programs development. Our fund also provides psychological, pedagogical and social services for mentally challenged children and their families. We have helped to more than 7000 mentally challenged children and trained 16000 social and medical workers since 1997. On March, 21 the World Down Syndrome Day was observed across the globe. Following a recent but already heartwarming tradition the theatre workshop acting under the auspices of the Downside Up charitable foundation has staged a new performance styled as a shadow show to mark this day. The performance is called «Alice's dream» and is based on Lewis Carroll's well-known book «Alice in Wonderland». Preceding the show, Ms. Anna Portugalova, director of the Downside Up charitable foundation, greeted everyone with a speech: «All our girls and boys, members of the theatre workshop, have been preparing for this day for a long time, rehearsing and doing their best. We see how they unfold and shape their talents in the course of the theatre classes, and we are delighted with them». The preparation works for new performance have been launched last оctober. «There are nearly thirty acts in the performance, and these imply numerous scenes, positions and movements, - the theatre director Nicholai Ilnitzkiy says. - We have assembled all parts of the performance together only for the final rehearsal which took place yesterday. Before we had to master the stuff through trainings aimed at developing attention, imagination, emotional and physical activity memory». «Alice's dream» is another exact coincidence with the spectators and actors emotional mood, with deliberate entwinement of conceptual emphasis and symbols. This allows the director to say: «We staged the performance upon Carroll's work but about our stuff». It's true, there is more than enough of «own» stuff in Carroll's fairytale in sync with the problems of integrating special people into everyday life. «Magic», «wonder» or, as Alice herself put it in Carroll's fairytale, «curiouser and curiouser» - such words could be used to describe the impression of the first night. Both the fragile, appealing shape of Alice and the disappearing smile of the Cheshire Cat as well as the extraordinary expressive plasticity of the Hatter, and the «Tea Parties» performed by the «sunny» actors at the fabulous professional mastery level - all of this made a deep long lasting impression on the spectators. If there is anything one could regret after such a magnificent show the only thing would probably be that it ended up so quickly. 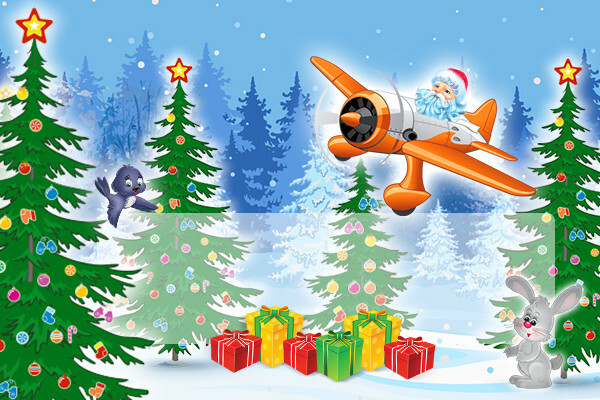 Downside Up has completed its on-line fundraiser, «The Further You Go», where participants were given the chance to play Santa Claus on the cusp of the holiday. These generous individuals worked their magic by giving the fund’s children gifts and skills, which they will certainly need later in life. During the fundraiser, donors picked out a virtual Christmas tree and ornament with a gift for a child and then paid for it. «The further you go, the more goodwill you'll find». They were certain of this at the fund, and they were right! 627 donors took part in the initiative and helped raise 607,960 rubles. Each participant hung an ornament with a child’s wish on the tree, and this forest of magical Christmas trees grew and grew! This miracle was possible because hundreds of people came together to change the future for children with Down syndrome. It’s so important – to speak so that people understand you, to learn to befriend others, to find common ground with adults, to be able to read to enter the first grade. «The Further You Go» fundraiser received the Golden Cat award from the Russian Fundraiser Association for «best on-line fundraiser». Charitable Fund “Downside Up” took part in the special event dedicated to World Down Syndrome Day and organized by inclusive theater project “Interaction” in cooperation with New Space Theater of Nations. Downside Up’s pupils participated in inclusive training for actors led by Boris Pavlovich, art director of socially educative department of Tovstonogov State Academic Bolshoi Drama Theater of Russia. A round table “Interaction Between a Painter and a Disabled Person” was held in the evening. Participants discussed the following questions: what do we mean by inclusion in the arts and how can it help our society to learn to recognize other people? Can this kind of special theater catch the interest of a viewer, not related to the “problem”? What can help this social project to become commercially viable, and special artists to get paid? 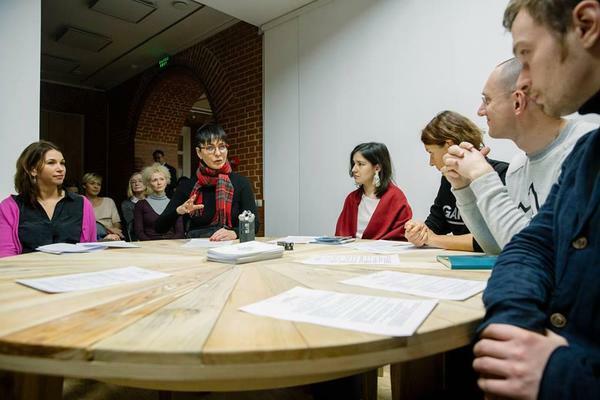 Nikolay Ilnitskiy, director at Downside Up’s Drama Studio was the speaker of this round table and shared how shadow play help children with Down syndrome to express their feelings, to increase their self-esteem and confidence and to socialize. A unique charity project, that knitted teenagers from European countries took place in Moscow and in culture and education tourism centre “Ethnomir”. It was called Downside Up Europe Teens Cup and was held for the first time. The idea of the event came to the Downside Up founder Jeremy Barnes and his 15- year-old daughter who see their mission both in supporting children with Down syndrome in Russia and in involving the young generation into charity. The participants of the project, 14-16- year-old teenagers, collected money by their own efforts for the DSU educational programmes before coming to Russia. When gathered in Moscow they studied our culture and traditions together with DSU leavers. The teenagers went to see “Ethnomir”, investigated the capital centre, visited Kremlin, came down to the Bunker-42 in Taganka, walked around VDNKh. In the end of their trip they spent a volunteer day at DSU and helped to prepare the educational and game materials for the new academic year. In the evening the guests with DSU graduates and employees walked along the Moscow river on a tourist boat. Downside Up took part in the charity auction named Action!